A necessity for transporting your game, Crosshair's 20x30/4 oz. 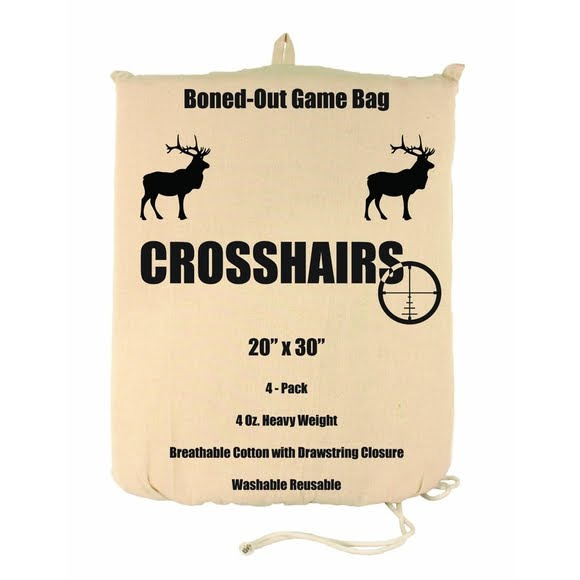 Boned-Out Game Bag is perfect for boned out meat and made with 4oz heavy weight breathable cotton. A necessity for transporting your game, Crosshair&apos;s 20x30/4 oz. Boned-Out Game Bag is perfect for boned out meat and made with 4oz heavy weight breathable cotton. Made with 4oz heavy weight Breathable cotton. Drawstring closure for secure transport. Washable and reusable for multiple season use. Measures 20 x 30 in.